Yesterday I showed you one way to use the Mountain Peak panel from the Sandscapes collection by Northcott. Today I’ll show you a different style border that you can use with the Canyon Cliffs panel from the same Northcott Sandscapes collection. Bonus! You can use this technique with any size panel. Before I made this quilt I did some planning using my EQ7 (Electric Quilt) program so I could make sure my border design would work with this panel. I wanted to use a ¾” inner border around the panel and then make a scrappy border using 2½” strips. Therefore, my panel with inner border had to be a measurement divisible by 2 (the finished width of my border strips). 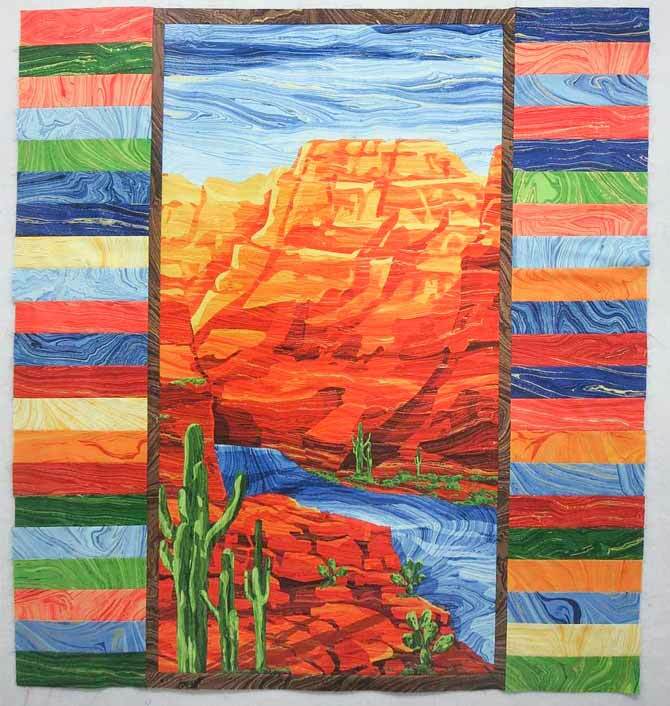 Here’s how to get started making this quilt with the Canyon Cliffs and Sandscapes fabric. Cut the panel so it measures 21″ x 41″. When I’m working with a large piece of fabric like this, I like to mark the cutting lines with a chalk marker before cutting it out. I also put a square ruler on the corners to make sure they’re really square. That way you can check to make sure everything is squared-up before you start cutting. Use a ruler to draw chalk lines on the panel as a guide for cutting. Use a square ruler to make sure the corners are really square. To make the inner border cut 2 – 1¼” x 41″ and 2 – 1¼” x 22½” strips from dark brown Sandscapes. 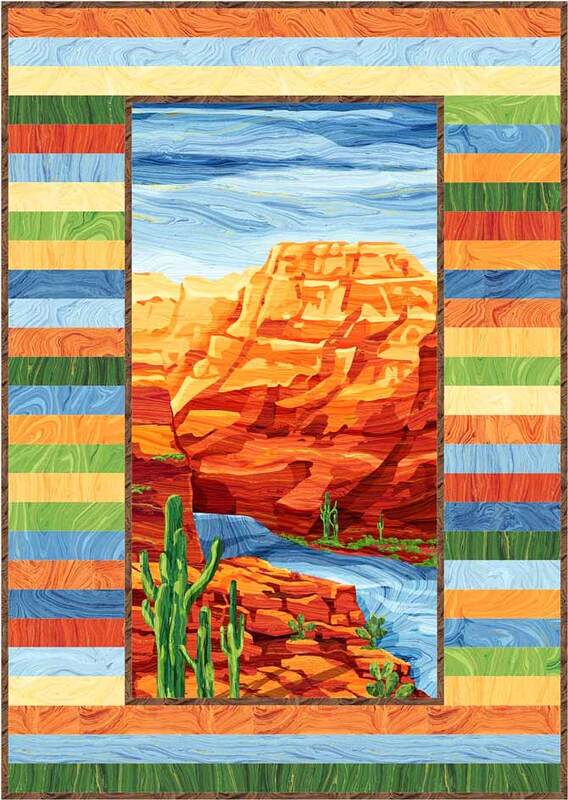 For the scrappy border cut 6 – 2½” x 38½” strips from 6 different Sandscapes fabrics. These will be used at the top and bottom of the quilt. For the side borders you need 42 – 2½” x 8½” strips in various colors. 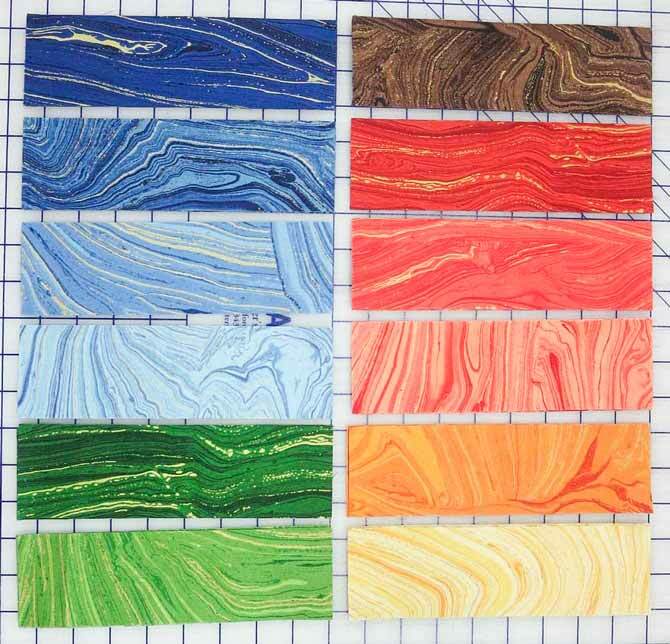 I used 12 different Sandscapes fabrics and cut 4 strips from each one. There will be 6 extra strips, but that will give you an opportunity for better variety when arranging the strips. Sew a 1¼” x 41″ dark brown strip to each side. Press seams toward strips. Sew a 1¼” x 22½” to the top and bottom. Press seams toward strips. Sew the dark brown inner border strips to the panel. Before sewing the border strips, you might like to place them on a design wall, to check the color arrangement. You need 21 border strips for each side. When you’re satisfied with your arrangement, sew 21 – 2½” x 8½” strips together to make a side border Press seams in one direction. Repeat to make the other side border. Sew on the side borders to the panel. Sew 3 different 2½” x 38½” strips together to make the top border. Press seams in one direction. Repeat to make the bottom border. Sew on the top and bottom borders. 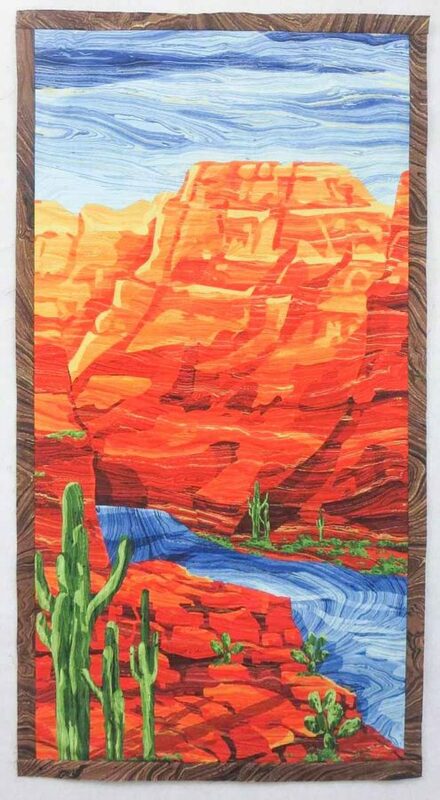 The Northcott Sandscapes fabrics and Canyon Cliffs panel make such a vibrant quilt! Now you’re all ready for quilting and then binding. I like to use a ½” finished size binding for my quilts. If you’d like to try this, cut 5 binding strips 3″ wide from the remaining brown Sandscapes fabric. When trimming the quilt after the quilting is finished, make sure to leave ¼” of batting and backing all around the outside edges of the quilt. Then sew on the binding with a ½” seam. 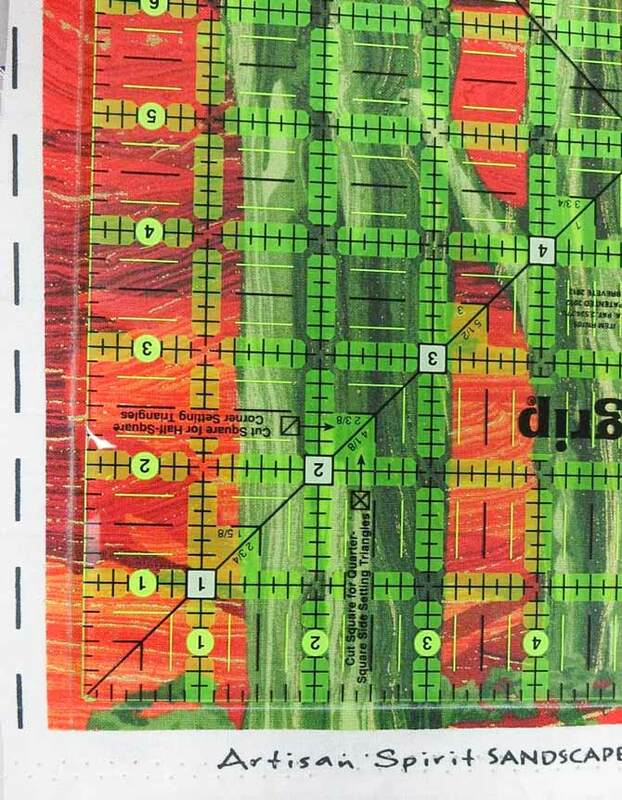 You can see more details about my binding method in this QUILTsocial post. 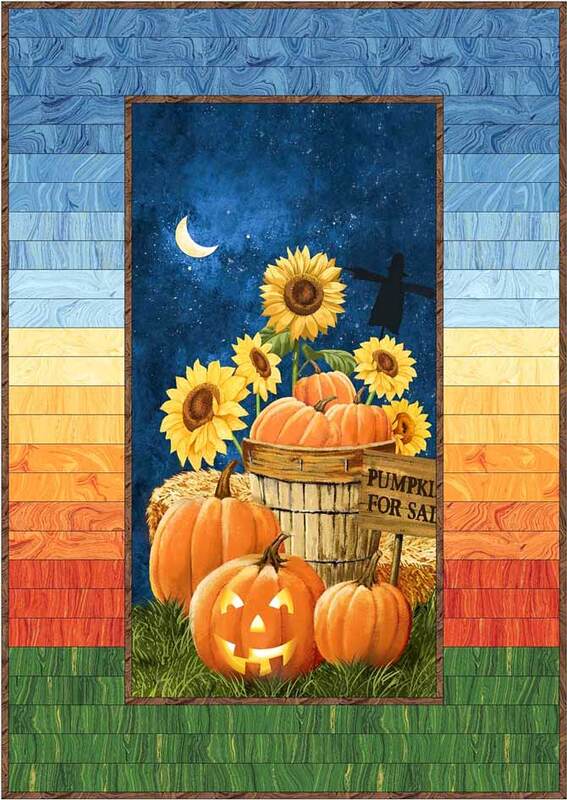 Come back tomorrow and I’ll show you a variation of this border that I used together with Northcott’s Pumpkins for Sale panel that will be in your favorite quilt shops in July 2017. 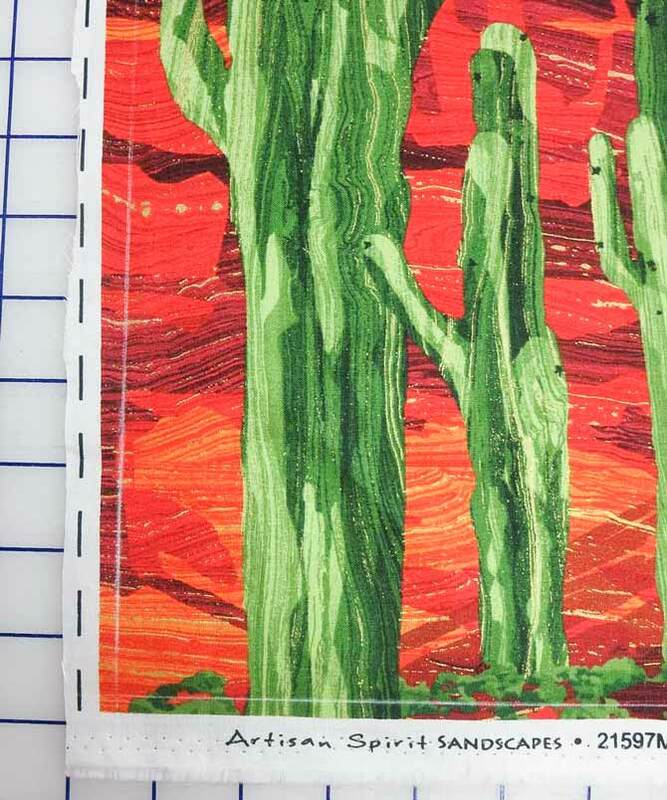 Again I’ll be using fabric from the exciting Sandscapes collection by Northcott for the borders. What fantastic info! You sure know how to perk up a panel. Thank you so much for sharing. Love the pumpkins for sale done with that border!! !